Left handedness is a problem no more in the kitchen! Many of the wooden cooking utensils I make are just perfect for lefties! 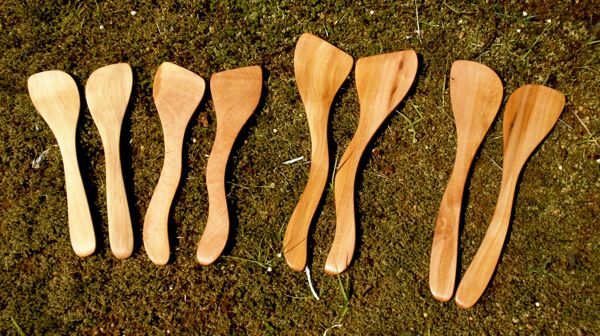 These lefty wood utensils are excellent for use as kitchen or serving utensils. Made from Arbutus/Madrone wood, you will find them so comfortable for your left hand! And they come in sizes from small, medium, large to extra large for all types of cooking pots and pans and for bowls of all sizes. You'll be able to cook up a storm with any of these or to serve your guests elegantly at the dinner table. What a delight for left handed people! It's amazing how many I make and sell! Often the wood piece I am working on allows me to cut only from the left side, and so I can end up with a few extras sometimes. The reason is that the wood piece may have flaws or cracks that I have to avoid. Trying to make a righty wouldn't work well so I make left handed products instead. Some of my designs are ambidextrous such as a spatula shape or spoon shape but most have a distinct design perfect for one hand or the other. A matching pair of a righty and lefty makes a wooden salad set, my biggest selling item. For a lefty, these wood kitchen utensils, with their perfect fit for the left hand, always seem to delight those who discover my individual designs. You can use them for cooking or serving or both. Just add mineral or walnut oil often to keep your wood happy and bright. My Mum was one of those frustrated lefties because many kitchen and dining utensils only work well for righties! It was probably one of the reasons she spent as little time as she could cooking, often preferring takeout and delivery. My brother is also a lefty. He overcame it by doing the minimum he could in the kitchen! I guess it is a just reward for all that extra time in the kitchen as a kid! Since my Mum was the inspiration for my starting to make wood craft utensils from the Arbutus tree, I very early on decided to make her comfortable wood utensils for her left hand, for her kitchen and serving needs. She was thrilled to say the least! Not because she could now spend more time cooking (you are not going to change that habit) but because she could serve her food easily. • and all that is taken for granted by righties! I then decided to make some wood utensils in the finest of my Madrone wood so she could also serve with them in the dining room. And so was born my Arbutus Art Culinary Collection. Mum enjoyed entertaining. She wanted something that would go great with her fine china and beautiful table settings, something that she could serve with. She loved my wood culinary crafts and asked me for more so she could give them as left handed gifts to a few friends, other lefties just like her. That kept me busy! And so now you will find on this site wonderful left handed products and gifts. I get many happy compliments from customers who enjoy the comfort of having a perfect fit for their left hand. Many of the salad sets that I make come with a distinct lefty and righty. Just feel free to use them for cooking and not just serving. Adding some food safe finish, such as walnut or mineral oil, sure will help keep your servers in top shape. Note: All my utensils have a natural food safe wood finish of pure walnut oil.